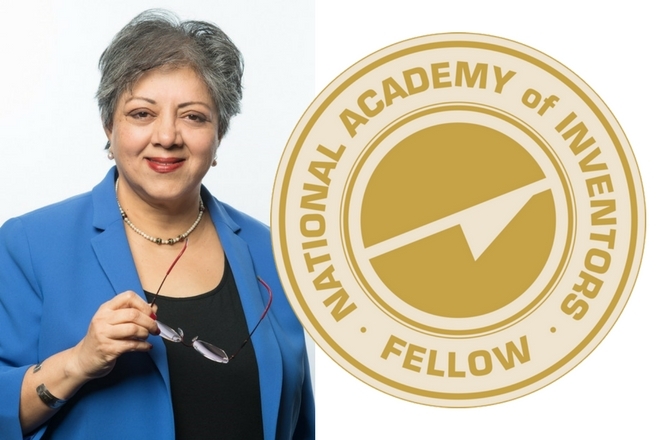 On December 5, 2017, BME Chair Dr. Ranu Jung was selected as an NAI Fellow. The National Academy of Inventors was founded to recognize and encourage inventors with patents to enhance the visibility of academic technology and innovation, educate and mentor innovative students, as well as translate the inventions of its members to benefit society. The NAI Fellows Selection Committee has chosen Dr. Jung as she “has demonstrated a highly prolific spirit of innovation in creating or facilitating outstanding inventions that have made a tangible impact on quality of life, economic development, and the welfare of society”. Dr. Pedro Hernandez states: “Dr. Jung is not only an inventor and entrepreneur; she is a great teacher who instills in her students and research associates the love of inventing. Dr. Jung is a leading expert in neural engineering and computational neuroscience. Her team at the FIU Adaptive Neural Systems Laboratory has developed the first implantable, wirelessly controlled, direct neural interface system for restoring sensations to amputees and has received FDA approval for conducting a first-in-human trial for this novel Class-III medical device system. My office has filed numerous patent applications related to this ground breaking neural interface system.” The induction ceremony will take place on April 5, 2018, at The Mayflower Hotel in Washington, D.C.. Dr. Jung will work with NAI in support of their mission to promote the importance of innovation and celebrate academic invention. Congratulations to Dr. Jung on this prestigious accomplishment! Click here to learn more.